Green, black and white – without the Gold? The SYF has long been considered a biennial highlight in the calendar of Performing Arts CCAs. In 2011, RI clinched 9 Gold with Honours, 6 Golds and 5 Silvers across Year 1 to 6. The Ministry of Education has announced that from next year, the SYF Central Judging will be renamed the SYF Arts Presentation. Instead of receiving awards, schools will receive certificates: distinction, accomplishment and commendation. The existing norm-referenced scheme will be replaced by one that is criterion-referenced, which means schools will no longer be benchmarked against each other. From next year, schools only need to score 75% to attain the highest award, rather than 85%. Ms Daphne Lim, Head of Department of Aesthetics (Year 1-6), commented that despite the changes, the SYF was “still a major national arts education platform for schools to develop cultural awareness and appreciation through the Arts”. She emphasized that the MOE had sent a strong message that the SYF was “indeed student-centric and not just for the schools’ glory”. Indeed, it seems that “something better” is in the works. While Ms Lim reiterated RI’s strong support for the festival, she also asserted that RI has its own plans to be a trailblazer in the area of arts education in the next few years. 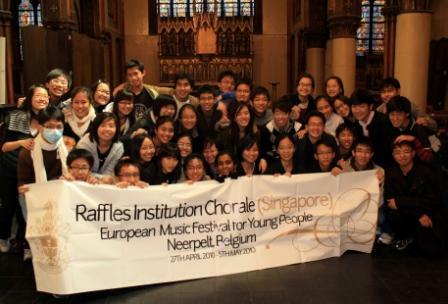 Part of this plan entails Raffles Chamber Ensemble and Raffles Symphonic Band breaking with tradition and withdrawing from the SYF Arts Presentations. Instead, they will form of the Raffles Symphony Orchestra concert under the aegis of the Aesthetics Department, and hold a concert in April/May 2014. This will be their second in what is planned to be a series of biennial performances, following a successful inaugural concert this year. However, such an option may not be available to all CCAs. Sng Geng feared that CCAs with little funding will have problems finding other avenues to showcase themselves and risk being overshadowed by CCAs which could afford to spend. Sean also expressed concerns that these changes would reduce the motivation for CCAs still participating in the SYF Arts Presentations to strive for the best and might affect standards in the long run. What do you think about the latest changes to the SYF? Tell us about how you feel in the comments boxes below.